Often people will say that you can tell a lot about someone’s character from his or her handshake. On Saturday, Benicia High’s Shelly Avelino could tell from someone’s else handshake that it wouldn’t be long until the Panthers junior was the best wrestler in the building. Avelino, the No. 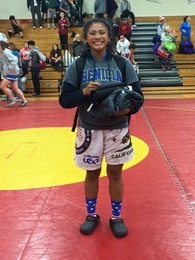 1-ranked girls wrestler in the 131-pound division according to thecaliforniawrestler.com, defeated Kiah Martin from Eureka in the championship match at the 18th annual True Wrestler Napa Valley Girls Classic. Avelino won by pin in less than a minute, but the 16-year-old said she knew she was going to win before the clock began running. At the tournament there were approximately 500 wrestlers, but as they say in the movie “Highlander”, in the end, there can only be one. On Saturday it was Avelino, who won the tournament’s Most Outstanding Wrestler award. Avelino said that going to the state championships last year in Visalia helped her drown out the pressure of competing at such a big event like the one this past week at Vintage High. Avelino won two matches the first day, but Saturday she says was more difficult. In the semifinals Avelino won by pin in the second period, which set her up for the championship match against Martin. Avelino said it finally hit her two days later on Monday how well she did by becoming the top wrestler at the tournament, but she admitted she has a long way to go before reaching her ultimate goal — a state championship. Last season Avelino placed fifth at state. Last week Benicia coach Craig Holden talked about Avelino’s drive to be the best at the end of the season. Avelino says she appreciates how Holden helps her constantly on and off the mat. Forrest Molinari and Ricki Liang. Now, she often talks to the two of them by phone or text. She also learned from the two of them how to be a leader on the Benicia squad. From what Avelino proved this past weekend on the mat, she’s basically everyone’s big sister. • Mason Boutain, Benicia boys wrestling. Boutain won the 152-pound weight division at the Joe Rios Memorial tournament in Chico and was named “Champion of Champions” of the tournament. • Tavian Henderson, St. Pat’s boys basketball. Henderson helped lead the Bruins to three wins during the week. He scored 19 points in a win over McKinleyville on Friday. • Gamon Howard, American Canyon boys basketball. Howard had 22 points, 10 rebounds, seven assists and three steals in a win over Pinole Valley. • Irfaan Jaleel, Vallejo wrestling. Jaleel placed second in his weight class at the El Camino Invitational over the weekend. • Wanna Wong, St. Pat’s girls basketball. Wong had 20 points and seven rebounds in a win over Gateway on Saturday.